Will you help ensure that our youth programs, including yearly summer camp, can continue to disciple and mentor more students every year? as well as their curriculum materials for their small group times. $4 per day per student! That’s only $125 per month! Please help! Every year, Streets Alive Mission operates a youth summer camp. We are blessed to have a fully equipped children and youth camp in the mountains donated to us for one week each summer, where at-risk kids can come and experience unconditional love and acceptance. The devices stay at home so that the kids can make meaningful connections with God, each other, and their leaders! Most of the kids who join us at camp are in our youth program, but many are first-timers—invited by our youth, to participate in what is often a life-changing experience. The kids who come are often coming from a challenging home experience, are usually at-risk kids and are all desperately needing the HOPE and strength that they find in Christ. For most, it is their first exposure to the love of Jesus! Our caring volunteers meet each student at the exact point where investing directly into his or her life can make the most difference. For so many, Camp changes the course of their lives. We have countless stories of that type of change. 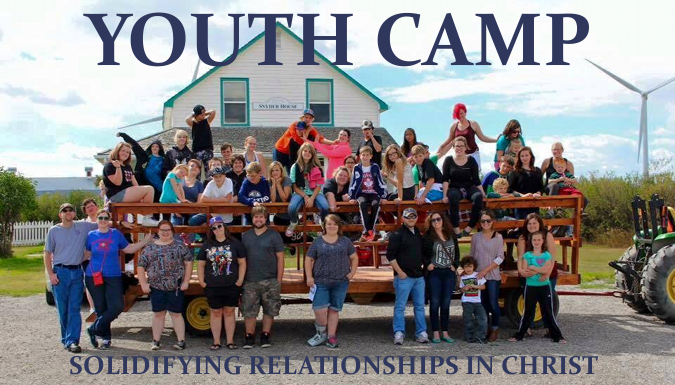 At camp, the youth are treated as part of a large family. We all prepare food together, we clean together, we take care of the young children who end up coming with their parents who volunteer. By investing their time and energy in camp each walk away realizing they have the ability to influence those who look up to them, and they take pride in serving each other. Many of our youth have found the love and support they need from our staff and volunteers to not listen to all the people telling them “you can’t” and have gone on to become graduates of high school and post-secondary education. For many, they are the first in their family, perhaps ever, to hold a diploma. A heart-wrenching number of these kids are in pain. Many of them have that pain come out in extremely destructive ways. Youth group and camp is an antidote to that pain! To say that the youth we serve have challenges, would be an understatement! Some of our youth find themselves as primary caregivers for younger siblings, often struggling to make meals with no groceries in the cupboard, or praying that their only pair of jeans hold out for one more week. Some are a parent’s paycheck away from being homeless. Some are dealing with addicted or abusive or absent parents. Some are being tempted by addiction themselves. Most are struggling with low self-worth and are often self-harmers. I wish I could say that they have the support they need to go to school, play sports, take music lessons but that isn’t the case. Our youth program runs 12 months of the year, providing these kids with a safe haven, love, unconditional support and the HOPE of Jesus. Our volunteers work shoulder to shoulder with our students supporting them through their faith journey. They celebrate victories together and share defeats. Camp is just the beginning, and is a safe place to “check out” our youth program, make some friends and experience a love they have never known. By investing in our Camp and youth programming, you make it possible for more and more youth to get involved. To find that safe haven where they learn accountability, learn to form healthy relationships, find mentors and spiritual guidance as they take their first halting steps towards being disciples of Jesus. A number of the youth have found a confidence inside themselves they never knew they had! These kids are becoming beacons of light in their homes, in their schools and their communities! You are choosing today to support a young person to break a cycle and in doing so, are lifting their entire family out of poverty! P.S. It’s SO much more than sending a kid to camp! Becoming a monthly donor for even $50 per month may not change your life. You becoming a monthly donor WILL change the life of a youth, perhaps even his or her entire family’s. Donate securely online today! P.S.S. This year camp runs from August 15-19. Please say a special prayer for the leaders and the youth during the next week leading up to camp, and during the camp week as well! It’s going to be an amazing time, but it isn’t always an easy time.Download our YOUTH TEAM PRAYER BOOKMARK. We respect your privacy and adhere to the Canadian Anti-Spam Legislation to protect your information, and you can easily unsubscribe at any time. We value our donors’ and subscribers’ privacy and do not share our lists.